Today the 1.7-mile wide space rock 1998 QE2 will harmlessly fly by Earth at a distance of 3.6 million miles at 4:59 p.m. EDT. 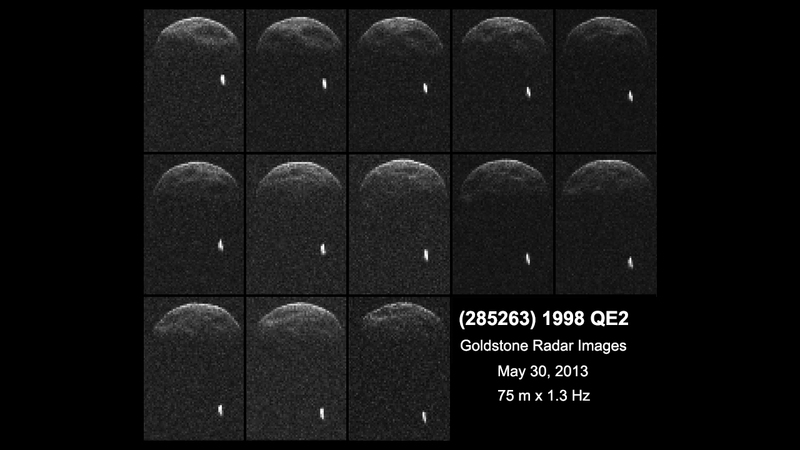 It is much larger than the 150-foot asteroid 2012 DA 14. It was also discovered on May 29th during radar observations of the space rock that 1998 QE2 has a moon. 16% of observed near Earth asteroids have moons. 1998 QE2’s moon is about 2,000 feet across, or many times the size of 2012 DA 14. The flyby will not be visible in the night sky to the unaided eye but amateur astronomers with backyard telescopes may catch a glimpse of the asteroid next week. NASA has been observing the asteroid using radar and will continue to do so for the next few days. Observations show dark surface features on 1998 QE2 and it is known to have a dark composition as it reflects only 6% of sunlight, making it darker than coal.